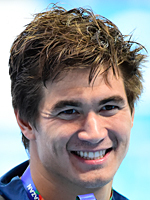 A three-time Olympic champion (4x100m freestyle in 2008, 100m freestyle and 4x100m medley in 2012), Nathan Adrian has every intention of adding to his medal collection in Rio. The American is determined to remain the king of the 100m, but will also be looking to bounce back after a disappointing 2015. At the World Championships in Kazan, he was pipped to 50m gold by Florent Manaudou, before coming a disappointing 7th in the 100m final. The only bright spot was the relay, where he helped the USA take gold in the 4x100m mixed freestyle and 4x100m medley. In Rio, 27-year-old Adrian will be dreaming of a first 50-100m freestyle double since Russia's Alexander Popov in 1996. Saina Nehwal said it was great to win the Nationals crown for the fourth time, and against a tough opponent like PV Sindhu.